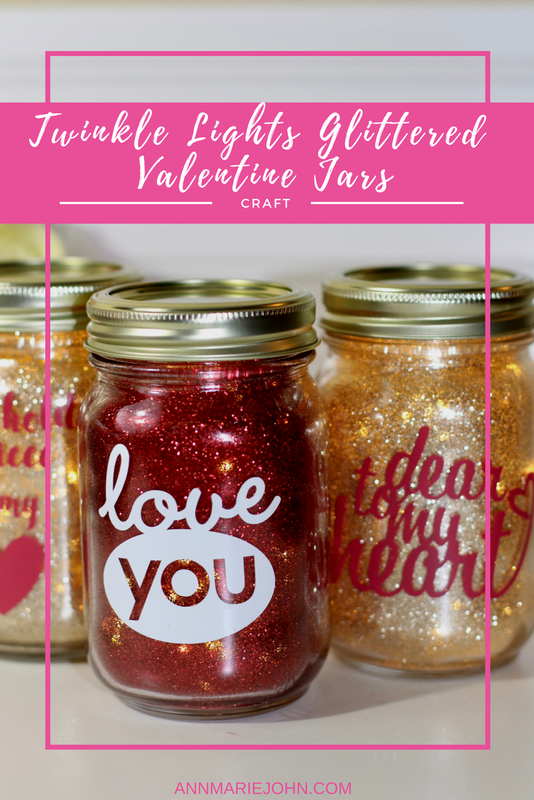 Sparkle and shine this Valentine's Day with these Twinkle Lights Glittered Valentine Jars. While I'm not big on Valentine's Day, I however decorate my home and celebrate my own way, after all I have kids and I don't want them to be disillusioned about the day. I love going into the stores and seeing them all decorated for the big day, I love the pinks and the reds and I also like decorating my entry way table. However, I love mixing and matching store bought items with home made. This year I decided that I wanted to do something a wee bit different. I had a few mason jars and some LED lights that I picked up at Christmas for another craft project, and inspiration hit. I knew exactly just what I was going to do with them. This Valentine's Day project literally took about 10 minutes from start to finish for each one, and they looked really good to boot! 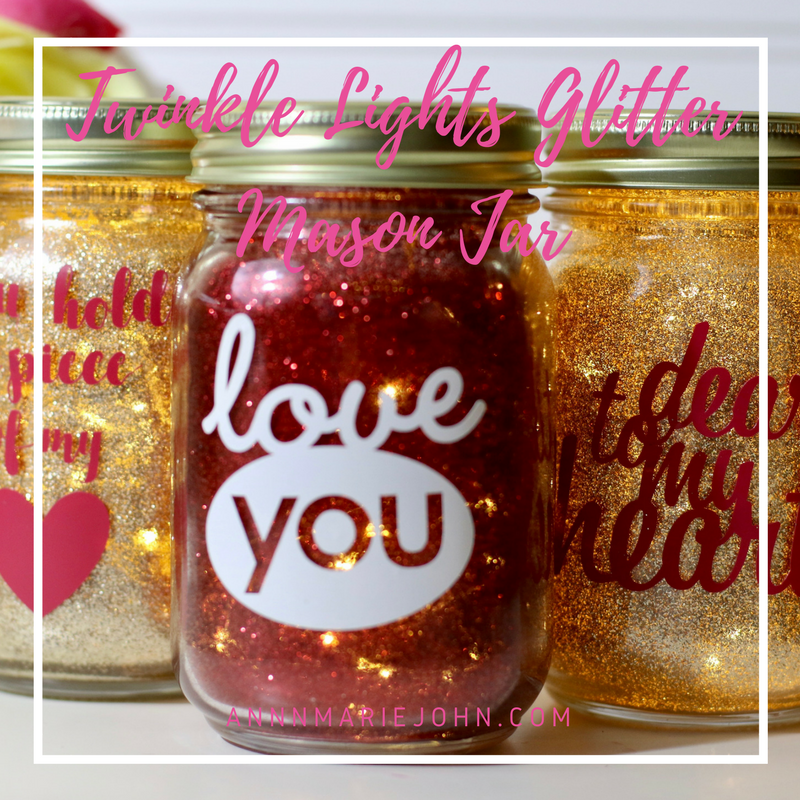 I'll link all supplies so you can make your very own twinkle lights glittered valentine jars. Note: I wanted my glitter to be on the inside of my jar and not on the outside, since I was going to use my Cricut to add a bit of charm on the outside instead. While you can use Mod Podge or even glue on the inside, it takes quite a bit of work. A quick search on google for an easier way led me to this quick and easy way of using a non-aerosol hair spray. I picked up the Suave Max Hold Hairspray at Walmart and it worked amazingly well! Pour some of the hair spray into your jar and swirl it around covering all the sides, then pour out the excess. Add your extra fine glitter on the inside and swirl it around as well until all the sides are "glittered". Let it dry for about 20 minutes. To get it to dry quicker you can use a hair dryer for about 2-3 minutes. Cut out your design that you want to use on your Cricut machine if you have one. If you don't, then you can use script letters or any sticker of your preference. With your jar cleaned, place the sticker or your Cricut design on the front of your jar in any location that you prefer. The LED lights are battery operated. Attach the battery pack on the cover of your jar and place the LED lights in the jar. Turn the lights on and you're done. If you would prefer not to use stickers or don't have a Cricut, you can decorate it with some ribbon for some pizzazz or leave as is. No matter how you do it, it's going to be one craft that will have everyone asking "where did you get it?". So let that crafty side show and get into the Valentine Day spirit. The jars came out nicely! I love the gold and adding the led lights really makes it pop! I've wanted a Cricut for a while now. So many things you can do with it. Those are so super cute! I have always said that everything's better with bling, and you proved it with these! Those are absolutely darling! I love the color and the shimmer. Such a wonderful idea. I LOVE LOVE LOVE these. Adorable. I have a thing for glitter so I'll definitely be making these with Toodie. It may be time to invest in a Cricut too. These look so cool! That glow works super well with the glitter. I think the red and gold together look amazing. These turned out so cute. I have seen so many cool crafts lately, I may have to get myself a Cricut! These turned out so lovely! Now I want to pull out my Silhouette and start crafting some Valentine's goodies too. Great tip using the hair spray. Definitely banking that tip for later use. These are super cute and a lot easier to make than i thought they'd be! I have a lot of mason jars just laying around and of course glitter! Cant wait to make these! The hair spray is a great idea. I love the way these look! These are so pretty! I love DIY projects that include glitter! What a very creative work. I love the effect of light in glitters and it was like a magical jar. Great job! These are so cute!! I love this idea! Such a cute Valentine's Day present and decoration! 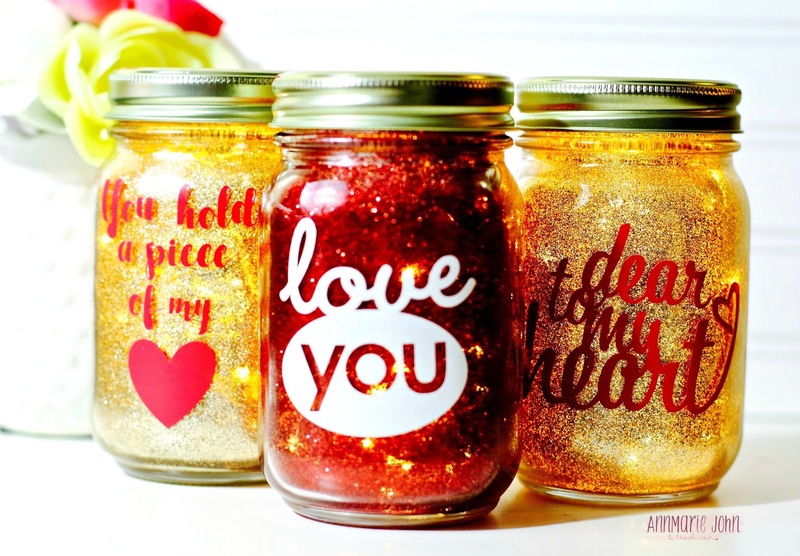 These DIY glitter jars would be great for any holiday or any occasion just by changing the theme or color motif. Thanks for the idea! Awesome DIY project! Hair Spray? Who knew? That's less expensive, faster and less messy too. I love it. These turned out really cute! Wow. That is so cool! very nice idea. It looks easy to make too. This looks like a fun project. I like the way you lay out the steps in an easy-to-follow fashion. You're really smart to #1, decide to put the glitter inside so it doesn't end up everywhere and #2, using Google to learn a fst & easy way to do this. Enjoy those glitter jars! I am loving this craft! I could really use this in my room for decor. Aside from the Valentine's Day theme, you can personalize it with your name too! I love how easy it is to do! Awe those are so cute. I bet they add a nice romantic lighting to any room. Now that is just an awesome idea. They look great and provide a nice function to any room. Very cool. How pretty are these?! I would love to add them to decorate a room in my home! 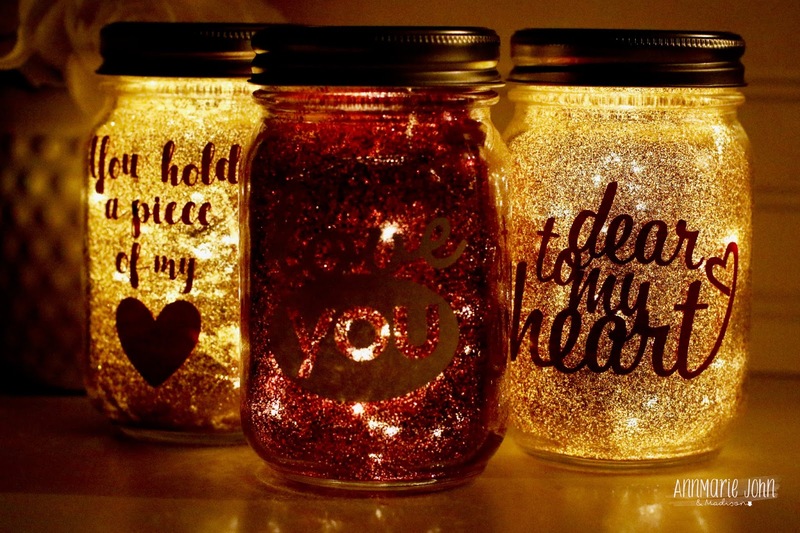 I love your Valentine Day jars. I do have a cricut and I am always looking for new ideas. Thanks for sharing your awesome idea and about the hairspray !! This is sooo cute and such a FUN and easy DIY for Valentine's Day! And I LOVE the new blog name and site design, it looks great! Pinning this for later! Pinned! I love Valentine's Day and I know many people don't.. and I get that.. but I love your spin on self-care and making crafts and making the best of them. These made Scarlet say, "Ooooooh!" These are gorgeous! I think I might have to make one with my daughter. She loves to make this sort of thing. Those jars turned out really nice. They're so pretty! I need to make some of these with my girls for Valentine's Day. Such a great idea! They are really pretty. Crafty kids would love assisting with making these. Headed to pin this! This is gorgeous! Valentine's Day is huge for us, we celebrate it as it was a birthday! Now this is the cutest Vday idea. This is unique and different I never seen this done before. Great ideas! I really love personalized things, I appreciate the efforts of the people who made it. These are so pretty and festive for Valentine's day. I must try these at home with my kiddies! Oh they are absolutely adorable! I also find these perfect for Christmas! You nailed it! Those are super cute!!! What a fun craft for the kiddos, too! This is such a cute ideas and so easy to make! Those are really cute! I'll have to remember those for next Valentine's day!